SEHO Systems, a worldwide leading manufacturer of automated soldering systems and customer-specific solutions, is launching its new SelectLine selective soldering system, featuring a PLUS in flexibility and efficiency resulting in a remarkable increase in productivity. Time plays a key role in modern electronic production, says the company. With its revolutionary design, the SEHO SelectLine product family offers the highest precision and solder joint quality as well as a high degree of flexibility: no change-over is required to dynamically process a variety of assemblies with short cycle times. 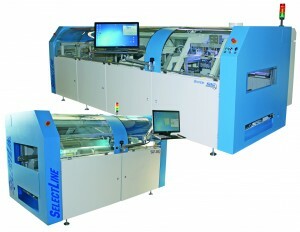 The SelectLine machine concept is consistently modular, thus ensuring clear cost benefits. The fluxer module, various preheat modules and soldering modules may be equipped individually, and depending on the requirements, they can be configured into a complete manufacturing line. Even the smallest version, SelectLine-C, which is designed for stand-alone operation in the basic configuration, may be expanded with fluxer and preheat modules at any time to be used in inline processes. The soldering area of the SelectLine scores highly thanks to its outstanding precision and flexibility. Two electro-magnetic soldering units for mini-wave processes may be integrated. Especially two new and unique features that are patented by SEHO ensure a remarkable increase in productivity.